Potato and egg – two of Leanne’s all-time favourite foods. A dish containing either one ingredient is usually completely eaten up, plate even licked. So imagine the joy when the meal consists both items. 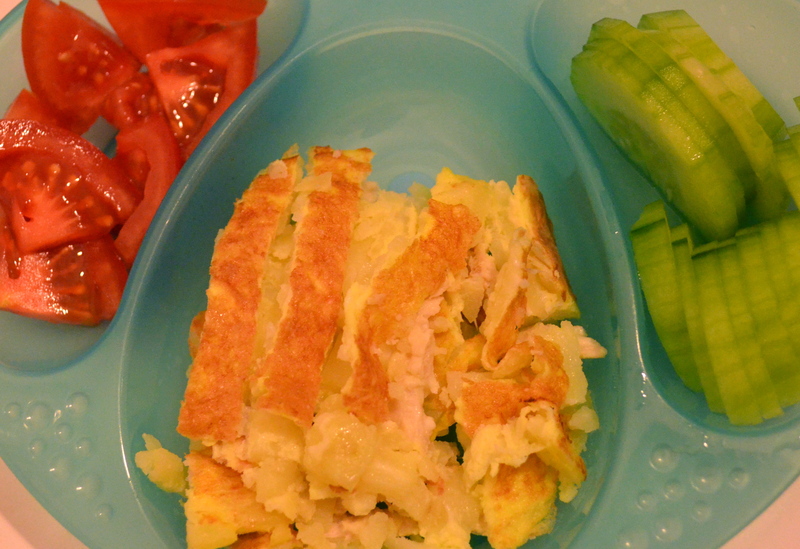 A big fan of tortilla myself, I came up with the following recipe for my 18-month-old. Admittedly, it’s a little more tedious to make than spaghetti bolognese. That’s why I make enough at one go for a couple of meals. 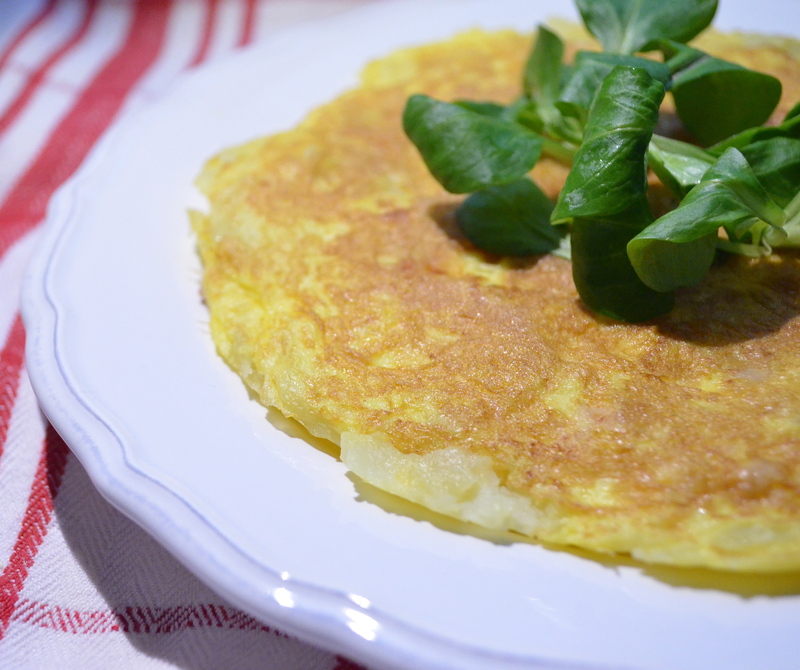 It’s an ideal dish for self-feeding as the tortilla can be cut into bite-sized pieces and served with cherry tomatoes and sliced cucumber. With the vegetable sides, it’s more than a perfect nutritional meal. *Salt is of course optional but I believe the chicken fillet would taste rather nasty without. I always add a little to improve overall taste. That’s all the salt I use in the recipe anyway, by the way. Better to have a toddler eating some salt than rejecting food that’s simply too bland. 1. Precook the ingredients. Peel potatoes and cut into very thin slices. Slice fillet likewise, into very thin pieces. Sprinkle a little salt on fillet. Boil potatoes and steam chicken. (My setup is simple. I use a small pot to boil the potatoes and top it with a bamboo steamer for the chicken.) Cook both items till they are tender. 2. Beat eggs in a bowl, add onion and cheese. Mix well. 3. Heat frying pan. Add a teeny bit of oil. Pour a quarter of the egg mixture into pan. Let the egg solidify a little. Arrange half of the portion of potato and chicken slices on top. Pour another quarter egg mixture over. Press down on tortilla with a frying ladle to bind the ingredients together. Flip tortilla over once the bottom is browned. Brown the other side. Remove from pan and allow to cool. Repeat with remaining ingredients. Cut into bite-sized pieces and serve. I used one of those special double-sided pancake pan to make the tortilla. Alternatively, you can try flipping the tortilla onto a plate and then sliding it back into the pan. That works equally well.